I made this for a couple of challenges at Splitcoast. First, Friday’s LSC260, to use a border punch and ribbon, and for today’s IC220. I chose this Chicken Cushion for my inspiration. 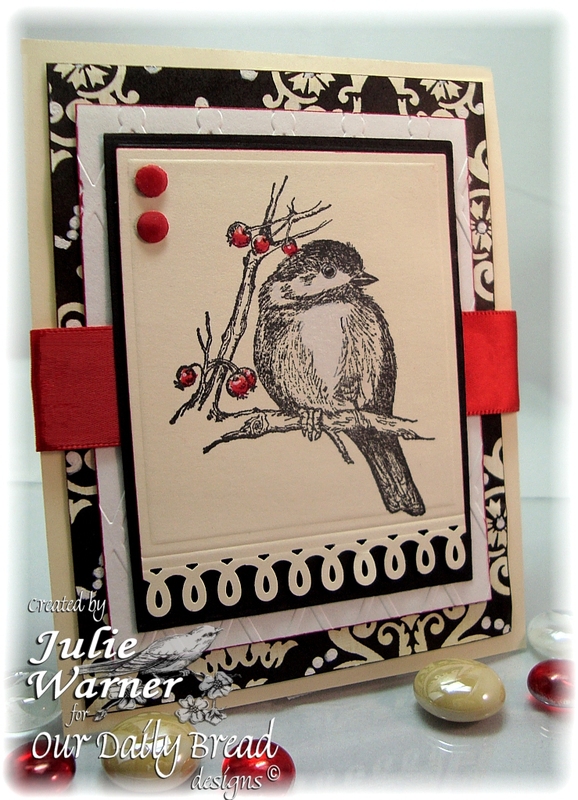 I used a pretty little Chickadee stamp from Our Daily Bread Designs, and I used similar colors. The chickadee was stamped onto ivory c/s and I colored in the berries and added a little white to his chest w/ Prismacolor pencils. I used a loop punch across the bottom and cut the rest out using a Spellbinders rectangle Nestie. I was careful to only emboss the bottom and not cut it. The white layer behing him was embossed using a Quickutz folder and it was lightly edged w/ a red marker. A layer of dp was added and a wide red satin ribbon and attached to a 4.25 x 5.5 (A2) ivory card. I made a couple of faux brads out of red c/s and added them in the upper left corner. 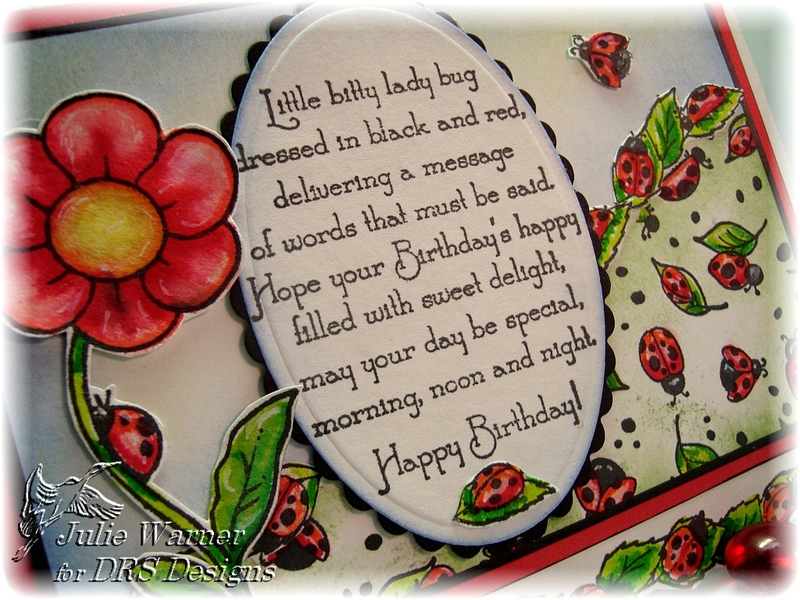 I hope you’ll follow these little ladybugs over to the DRS blog and check out the big picture with all the details. 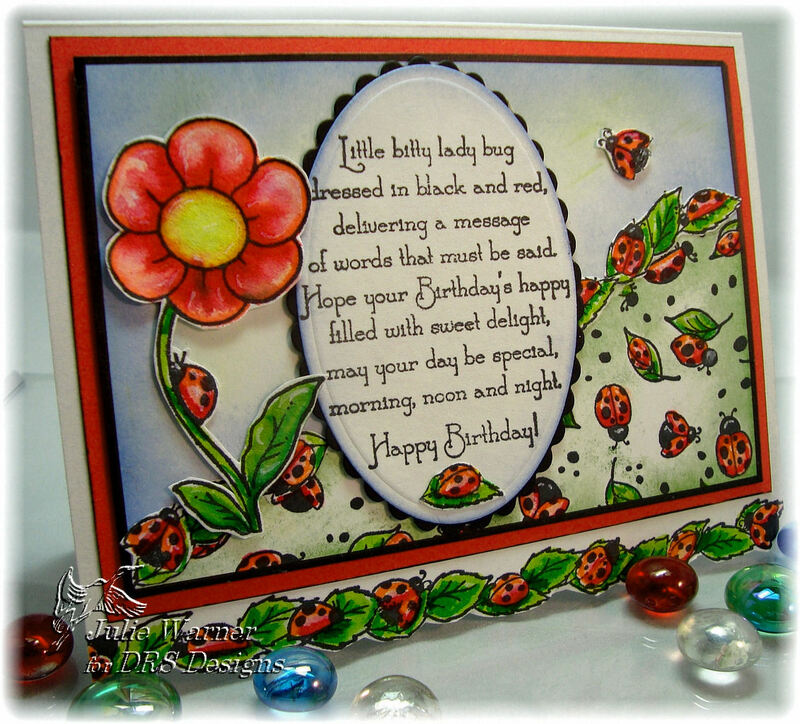 C’mon, how can resist these cute little ladybugs? 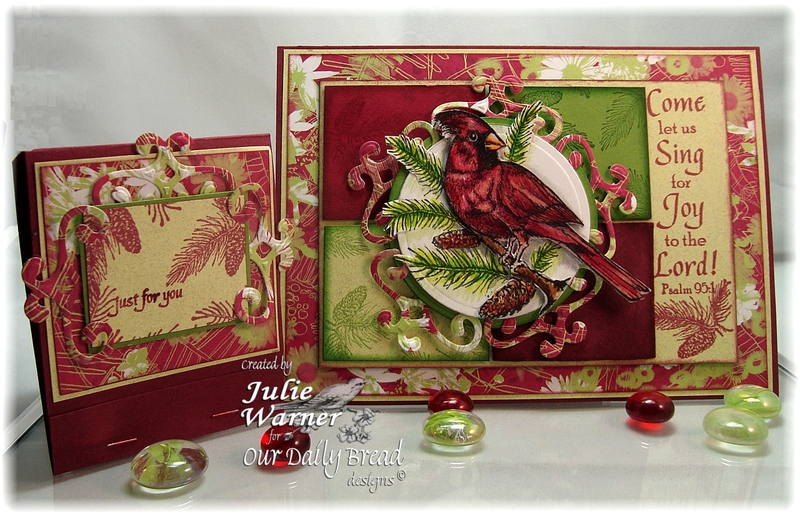 I started out making this for the Inspiration Challenge on Saturday and couldn’t quite get a handle on the layout, but I loved this little red bird so I used him for my inspiration. Then Sunday’s Featured Stamper challenge came and I did a couple for it, but I also saw this Inspired in Colors Laurie made and loved her layout. I did change the images, colors and added a long sentiment panel on the side but kept her blocks of color w/ the stamping on them. Then today, the Technique Lover’s Challenge had a cute little matchbook candy holder and the instructions were easy enough that even I could follow them. So I added the little matchbook to my card and finally finished. I’m using a new February set, Sing for Joy, from Our Daily Bread Designs. 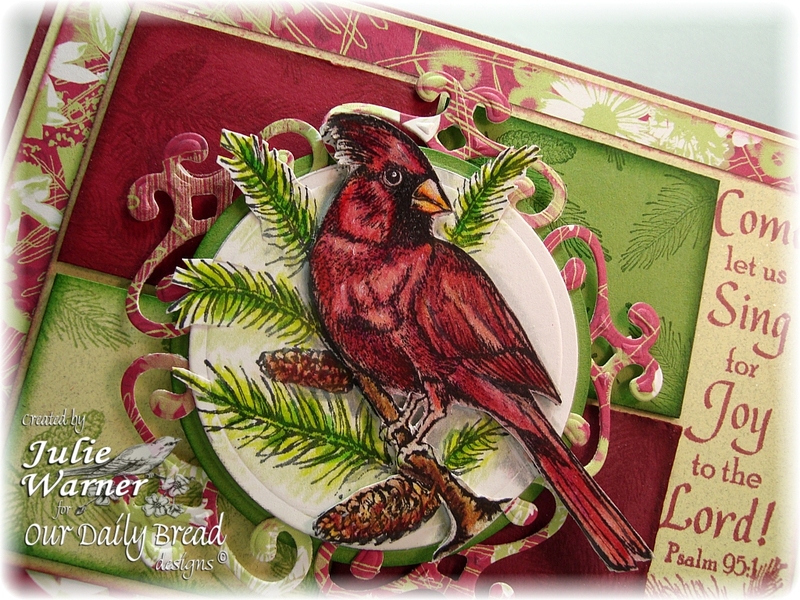 After stamping the cardinal a couple of times, I colored them in with Prismacolor pencils and used my Out of the Box Nestie Technique on one. On the second one, I cut him and the branch out and added him on top of the base image. A green circle mat was added underneath and I cut 5 ends only of the Spellbinders fancy tags out of dp and added them around the circle. I cut 4 small rectangles out of 4 colors of c/s, stamped the pine cone branch and sponged around the edges. It’s attached to a sparkle lime green layer that has the sentiment and another pine cone bough stamped down the right side. A layer of dp, another lime layer and finally a burgundy layer finish it. I used leftover pieces to make my little matching matchbook and part of sentiment from another ODBD set, You Will Find Refuge. I couldn’t remember where I put my fancy colored staples, so I used some plain silver mini staples and colored them w/ a Sharpie.